While crew transfer vessels (CTVs) may have become synonymous with offshore wind farm support in recent years, the burgeoning aquaculture sector, with its strong requirement for offshore fish farm maintenance, is also creating demand for these vessel types. One such CTV customer is Norwegian fishery Emilsen Fisk, which recently took delivery of a new crew boat from Danish designer and builder Tuco Marine. 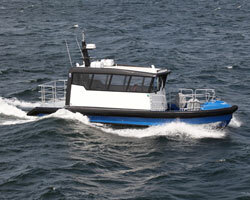 The boat (to be christened later this month) was built to the specs of Tuco’s ProZero 11m Daughter Craft (DC) range (see Technical Particulars, below), and will carry personnel between shore and Emilsen Fisk’s fish breeding plant, located off the coast of Rørvik, north-west Norway. The DC variant is described as an evolution of Tuco’s 11m wind farm CTV design, specifically tweaked for fish farm personnel transfers. The vessel has been designed to operate in wind speed conditions of 0-25m/s (0-49knots), and to accommodate a single crew member in an air suspension seat, positioned forward, in the main cabin. Additionally, up to five additional persons can be seated separately within this cabin. To balance out this increased drain on power, Tuco has attempted to lower fuel consumption by reducing overall vessel weight. Part of this effort included use of composite materials, utilising a mixture of carbon fibre and fibreglass in a sandwich design with a PVC core, with the main hull shell built using vacuum infusion in a ‘one-shot’ operation. As well as keeping weight down, the advantage of this technique is a reduced need for maintenance, Tuco points out, as well as enhanced buoyancy and zero water absorption. Given the craft’s rather minimal crew complement, it was also important to make standard operations as hassle-free as possible. To this end, a large flush hatch has been mounted on the aft deck, directly above the engine room, granting easy access to the vessel’s sole Volvo Penta D6-400 diesel engine, which drives a pair of Z-drives. Similarly, the tank space can be accessed from the deck via a single hatch. Combined with these weight savings, the selected engine is capable of granting the boat impressive transit speeds: upwards of 35knots was recorded during the boat’s sea trials, though typical service speed is more likely to be region of 25knots. This upper limit, Pedersen adds, is some 11knots faster than Emilsen Fisk’s previous CTV – an increase achieved without a subsequent hike in fuel consumption.